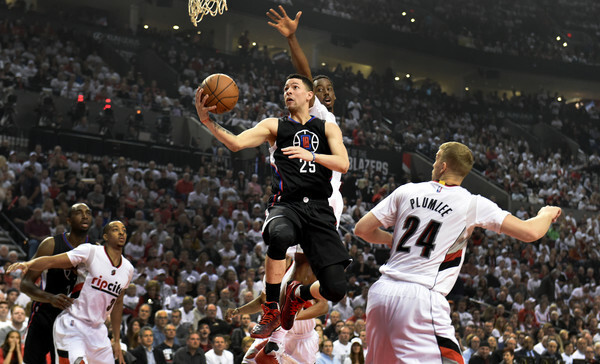 Austin Rivers #25 of the Los Angeles Clippers drives to the basket on Al-Farouq Aminu #8 of the Portland Trail Blazers as C.J. McCollum #3 and Mason Plumlee #24 of the Portland Trail Blazers look in the first quarter of Game Six of the Western Conference Quarterfinals during the 2016 NBA Playoffs at the Moda Center on April 29, 2016 in Portland, Oregon. NOTE TO USER: User expressly acknowledges and agrees that by downloading and/or using this photograph, user is consenting to the terms and conditions of the Getty Images License Agreement.